The goldenrod leather wing, Chauliognathus pennsylvanicus, is a frequent visitor to goldenrod in late summer and autumn. Friendly soldiers – Soldier beetles, Chauliognathus spp. In last week’s episode, we visited delightful fireflies that are enjoying a spectacular year. In addition to learning about their incandescent skills, we observed their curious and sometimes deadly mating rituals. This week we visit a cousin of the firefly called the soldier beetle, a.k.a. leatherwing. Both fireflies and soldier beetles belong to a group of beetles in the superfamily Elateroidea, that also includes click beetles and several other related families. Like other members of this clan, soldier beetles are natural born killers in both adult and juvenile stages and are highly beneficial rascals to have around the garden. Velvety soldier beetle larvae attack many ground and plant dwelling pests. The juvenile stages are dark grey larvae cloaked in a thick, velvety coat of fine hairs. They are important predators of ground dwelling insects and they will ascend plants to find prey in flowers and on fruit and foliage. I often see large numbers of these hairy rogues in autumn hunting in flowerbeds or on sidewalks and patios. 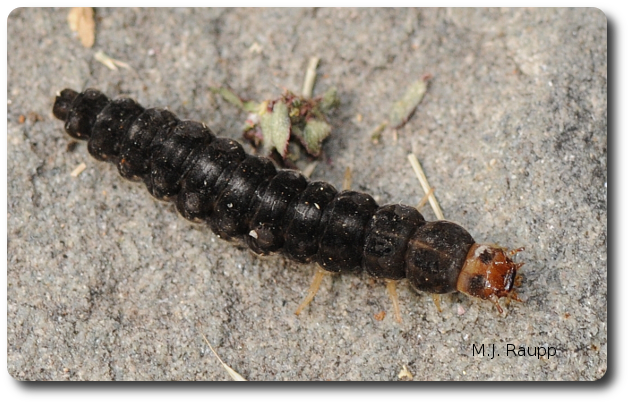 Soldier beetle larvae visit homes in fall when they squeeze beneath the door sweep. When I find them inside, I simply pick them up and return them to the wild. For soldier beetles in Maryland, the larva passes the winter in soil, under leaf litter, or beneath loose bark. The renaissance in fireflies discussed last week seems equaled by soldier beetles, which appeared in record numbers on blossoms of perennial plants in my flowerbeds. When not consuming nectar and pollen, adults dine on plant pests such as aphids and caterpillars. Mating antics of soldier beetles seem to occur almost nonstop and are quite entertaining. Their rambunctious behaviors have been the subject of several studies. In the soldier beetle dating game, size does matter. Witness the goldenrod soldier beetle, Chauliognathus pennsylvanicus, where biologists discovered that mating females and males were significantly larger than their smaller and less fortunate, non-mating counterparts. It turns out that female soldier beetles are choosy lasses and exercise their prerogative to accept or reject a potential mate. The advantage to large size in males is not so much a “big guy, good look” feature that attracts the females. Apparently, large size enables an amorous male to subdue a coy female beetle more effectively than his smaller competitors, whose attentions can be dismissed by the discriminating lady. Irrespective of how they play the dating game, last year must have been a very good year for soldier beetles based on the remarkable numbers found in our gardens and landscapes this year. Let’s hope this trend continues for all of the Elateroidea clan. Bug of the Week thanks Dr. Shrewsbury for providing images and inspiration for this week’s episode. The interesting article “Density Dependent Sexual Selection and Positive Phenotypic Assortative Mating in Natural Populations of the Soldier Beetle, Chauliognathus pennsylvanicus” by Denson Kelly McLain was used as a reference for this episode.